Apple has just launched a new ‘campaign’ thingymajig on their website stating why the iPhone is better than everything else. 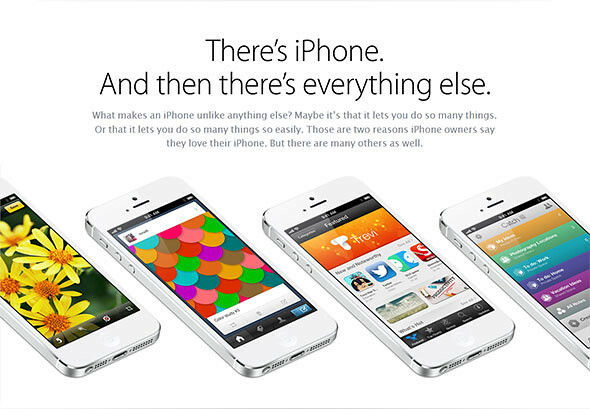 In the page, Apple listed out the reason’s why you should love the iPhone and not others. iPhone has received eight straight J.D. Power and Associates awards for customer satisfaction. It’s nearly impossible to make a device so thin and light without sacrificing features or performance. Yet iPhone 5 achieves that goal. It’s an accomplishment of engineering as much as one of design. Every detail and every material — particularly the sleek aluminum enclosure — has been meticulously considered and refined. And it’s made with a level of precision you’d expect from a finely crafted watch, not a smartphone. As a result, iPhone feels substantial in your hand and perfect in your pocket. The Retina display on iPhone ushered in the era of super-high-resolution displays. Its pixel density is so high, your eye can’t distinguish individual pixels. The images and words are amazingly vivid and crisp. Everything just looks so real. In fact, once you see a Retina display, you’re never satisfied with anything less. Yet it remains a feature found only on iPhone and other Apple products. … and there are more on their site. Why are they doing this? Are they afraid that with all the new phones that came out recently, users will forget them? Are they starting to worry about their position in the market? Seems like it.